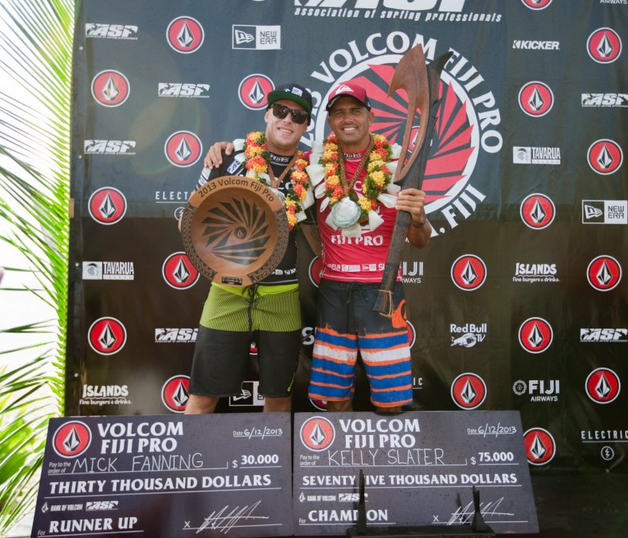 Kelly Slater dominated the final rounds at the Volcom Fiji Pro en route to his second consecutive title in Fiji, once again proving why he is the world's best competitive surfer ever, and why Cloudbreak is one of his favorite waves. His quarterfinal-semifinal-final scores were almost too high to believe unless you've seen the waves: 20.00, 18.17 and 19.80. 2 perfect 10's in the quarterfinals! Nearly repeating 2 perfect 10's in the finals. And let's not forget Kelly had a 19.30 in round 4. Slater freakin' dominated! 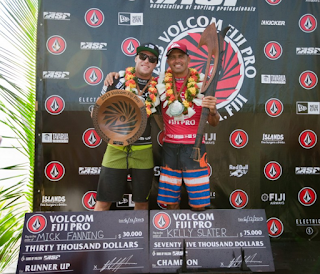 John John Florence was next best surfer giving Kelly a run for his money with consistently high scores throughout the competition. Back in action after missing the last 2 events due to an ankle injury, John John was dialed in for this competition. He handled surfing's (previously) hottest surfer, Jordy Smith, in the quarterfinals, posting a 19.06 for himself and earning a semifinal matchup with Slater. Halfway through the heat Kelly had a 7.00 and 9.40, the 9 point wave punctuated by 3 bottom turns followed by huge hacks off the top, and John John had...a 2.90. But John John made it interesting late with a 8.17 and a 5.83, which just weren't enough. Anyways, Kelly upped his total with a 8.77 when he made it out of from a "nice little" coverup. Ho hum. 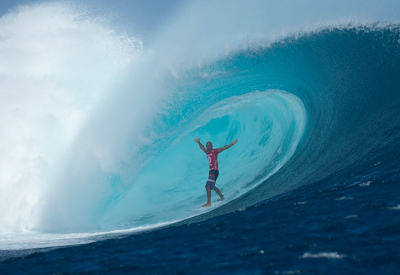 Mick Fanning fought his way through the other side of the bracket to meet Kelly in the finals. Mick narrowly edged out his mate Joel Parkinson in the quarterfinals, setting up a matchup with "surprise" seminfinalist CJ Hobgood, who won an ugly quarterfinal heat against Josh Kerr with a combined total of 7.77. Both Mick and CJ scored an 8.00 ride early, leaving the heat within striking distance for either surfer. CJ took the lead with a strong coverup-hand-up-claim, only to have Mick come out of two tubes on a late wave, to steal the heat by .4 points. The finals was more of the same from Kelly, although Mick struck first with a huge draining barrel for a 9.20 and the early lead. Halfway through the heat Kelly turned on, stalling into a super-long barrel for a 9.80 (take that, Mick) and following that up with a 10! Even after watching the replay it's still hard to believe he came out of that wave. At that point, Mick was combo'ed and it was all over. Kelly taking back-to-back titles. Look out next for the Oakley Pro Bali in less than a week - June 18 to June 29.